Ranbir Kapoor- Katrina Kaif's Relationship Is Getting More Worse? Home BOLLYWOOD Ranbir Kapoor- Katrina Kaif’s Relationship Is Getting More Worse? Ranbir Kapoor- Katrina Kaif’s Relationship Is Getting More Worse? [tps_footer]We really loved Ranbir Kapoor-Katrina Katrina Kaif’s relationship and if the rumours were to be believed these two were going to tie a knot soon. But their break-up news not only shocked their closed ones, but it was indeed shocking for all their fans as well. While everyone wished that both of them get back together, things were just getting worse. While Ranbir left their love nest where the duo used to stay in their happy times, Katrina continued to stay there. 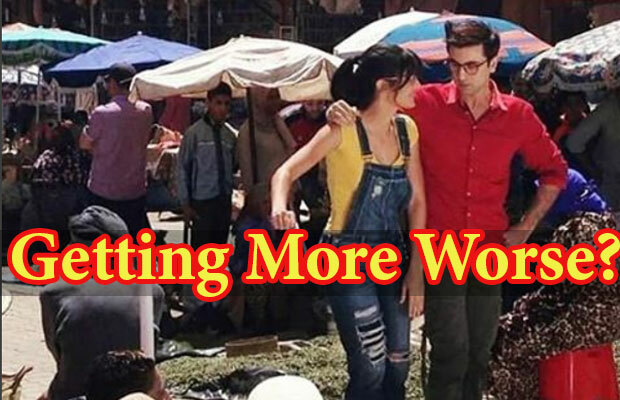 Soon both of them started working on their upcoming flick Jagaa Jasoos, while Katrina really tried to get Ranbir back, it seems like Ranbir is in no mood to patch up with his lady love and Katrina is leaving no stone unturned to get back with Ranbir. Recently they were shooting at Morocco for their upcoming film while most of us thought that the former couple will kiss and hug each and give a new start to their relationship, but sadly they hardly spoke on the sets. While Ranbir is set to return to Mumbai in 2 to 3 days, Katrina will fly back to London to spend some quality time with her family. Morocco could have done wonder for the duo, but it seems like Ranbir is in no mood to get back with Katrina and with this we think that Ranbir-Katrina Relationship getting worse and we can just hope for some miracle to happen. What do you think will Ranbir-Katrina ever patch up? Next articleOh No! Shah Rukh Khan’s Part From Salman Khan’s Sultan Chopped Off?